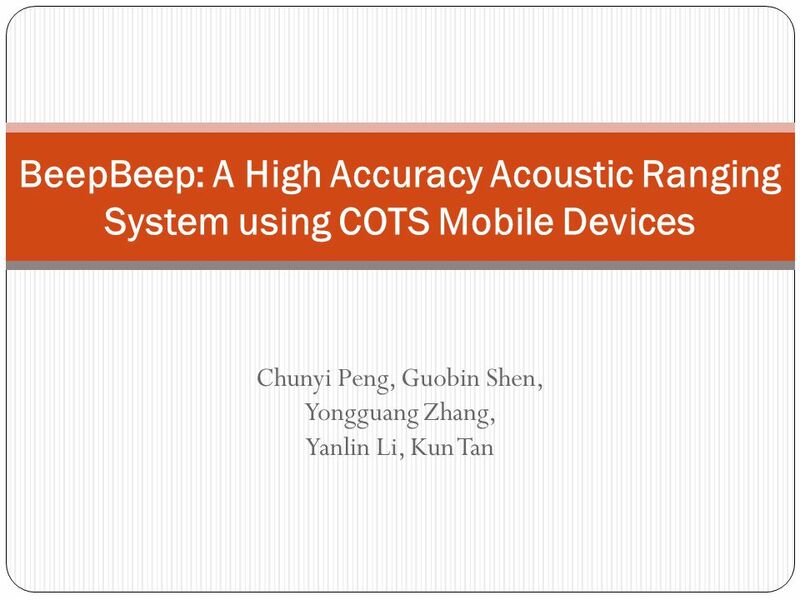 Chunyi Peng, Guobin Shen, Yongguang Zhang, Yanlin Li, Kun Tan BeepBeep: A High Accuracy Acoustic Ranging System using COTS Mobile Devices. 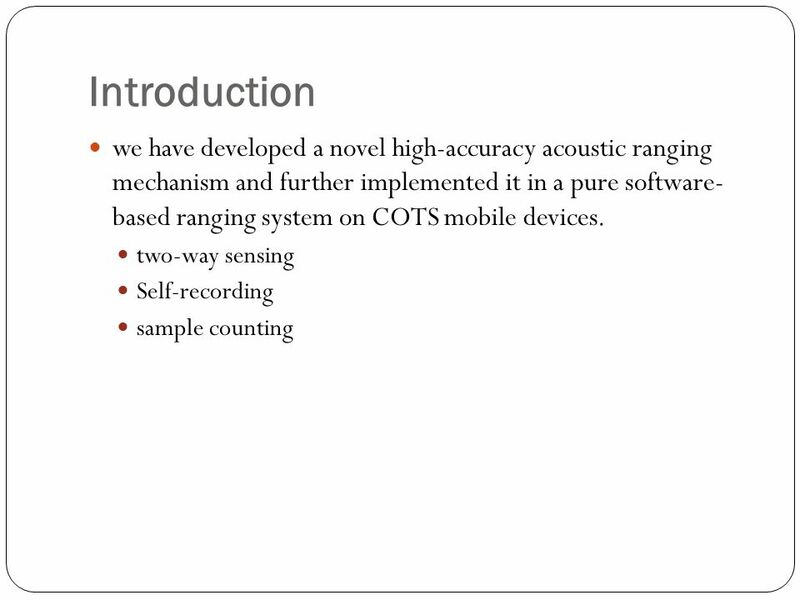 2 Introduction we are interested in high accuracy ranging using only the most basic set of commodity hardware capabilities: a speaker a microphone some form of interdevice communication. 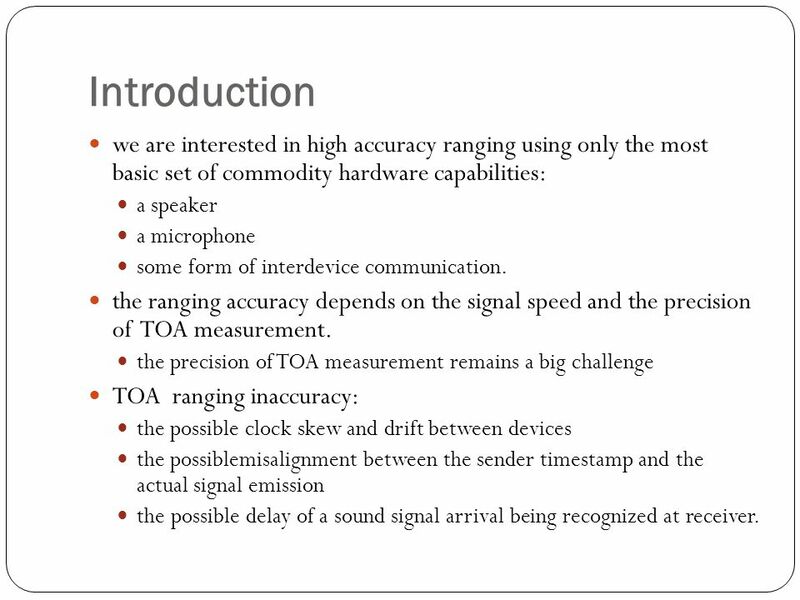 the ranging accuracy depends on the signal speed and the precision of TOA measurement. 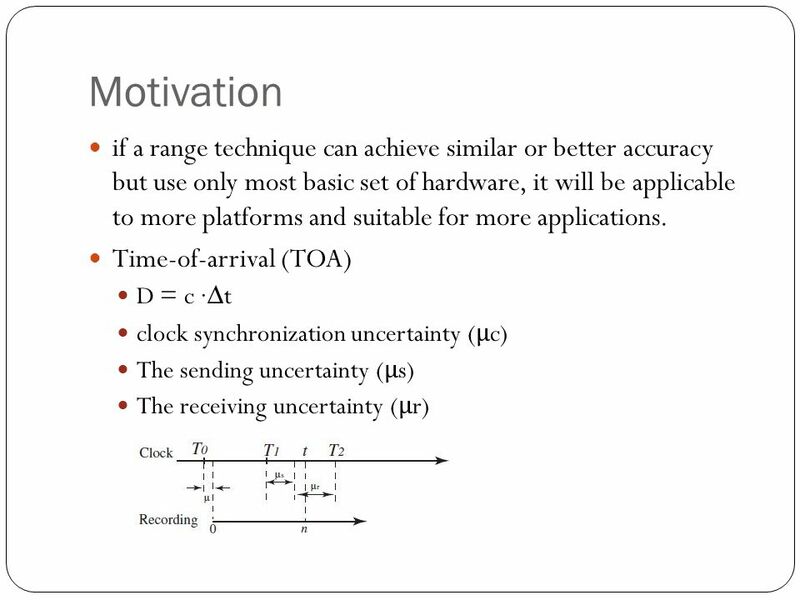 the precision of TOA measurement remains a big challenge TOA ranging inaccuracy: the possible clock skew and drift between devices the possiblemisalignment between the sender timestamp and the actual signal emission the possible delay of a sound signal arrival being recognized at receiver. 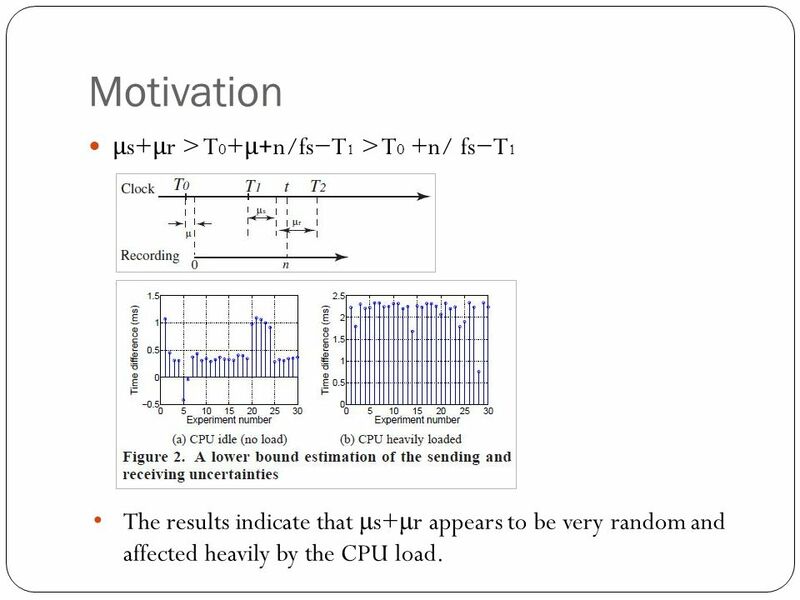 5 Motivation μ s+ μ r > T 0 + μ +n/fs−T 1 > T 0 +n/ fs−T 1 The results indicate that μ s+ μ r appears to be very random and affected heavily by the CPU load. 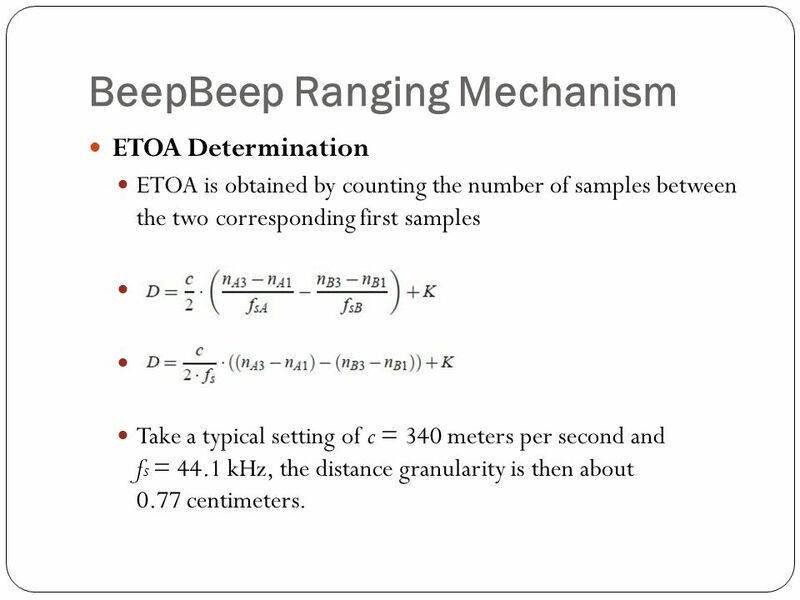 8 BeepBeep Ranging Mechanism ETOA Determination ETOA is obtained by counting the number of samples between the two corresponding first samples Take a typical setting of c = 340 meters per second and f s = 44.1 kHz, the distance granularity is then about 0.77 centimeters. 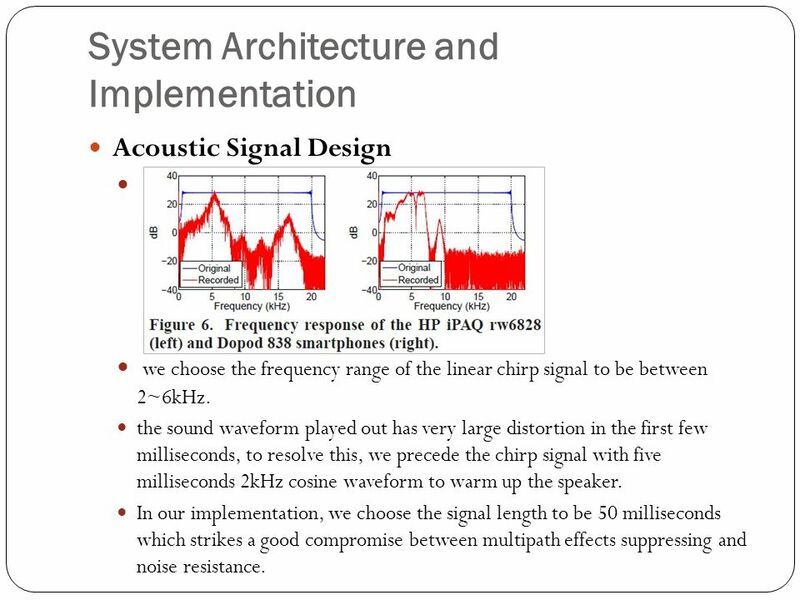 11 System Architecture and Implementation Acoustic Signal Design we choose the frequency range of the linear chirp signal to be between 2~6kHz. the sound waveform played out has very large distortion in the first few milliseconds, to resolve this, we precede the chirp signal with five milliseconds 2kHz cosine waveform to warm up the speaker. 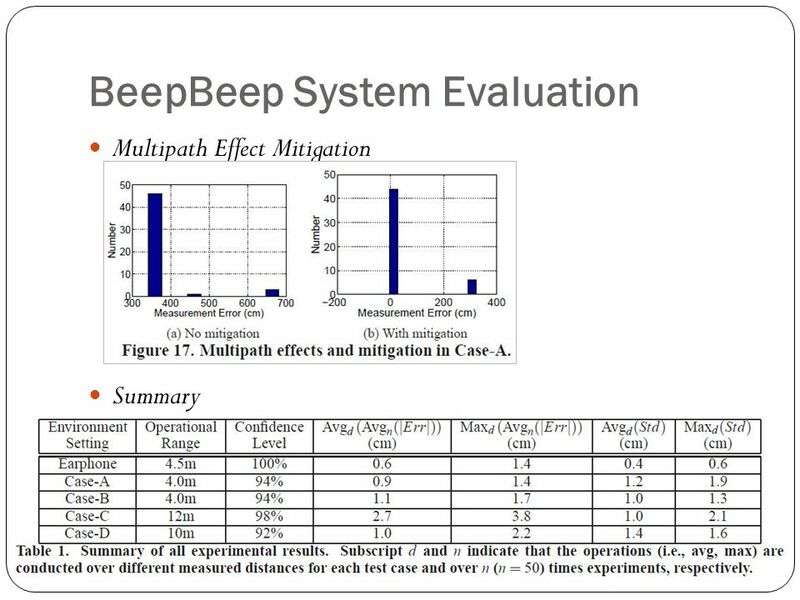 In our implementation, we choose the signal length to be 50 milliseconds which strikes a good compromise between multipath effects suppressing and noise resistance. 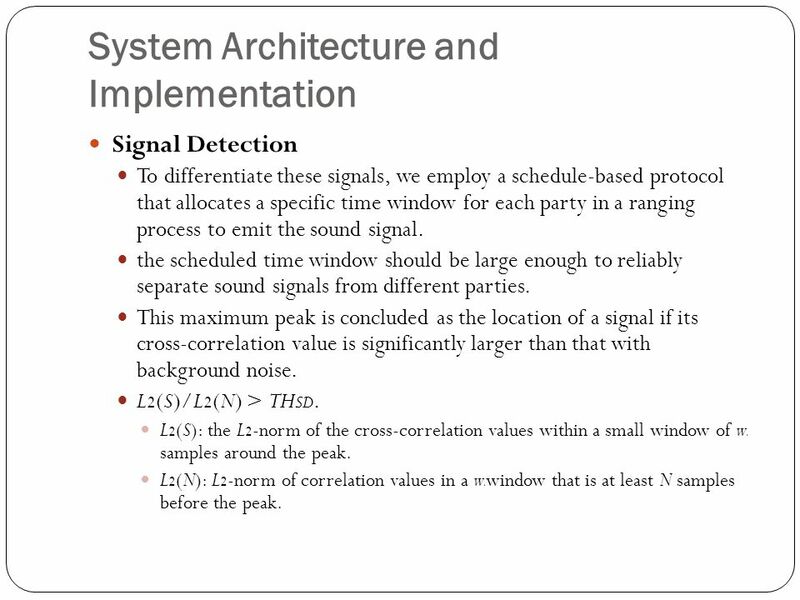 12 System Architecture and Implementation Signal Detection To differentiate these signals, we employ a schedule-based protocol that allocates a specific time window for each party in a ranging process to emit the sound signal. the scheduled time window should be large enough to reliably separate sound signals from different parties. 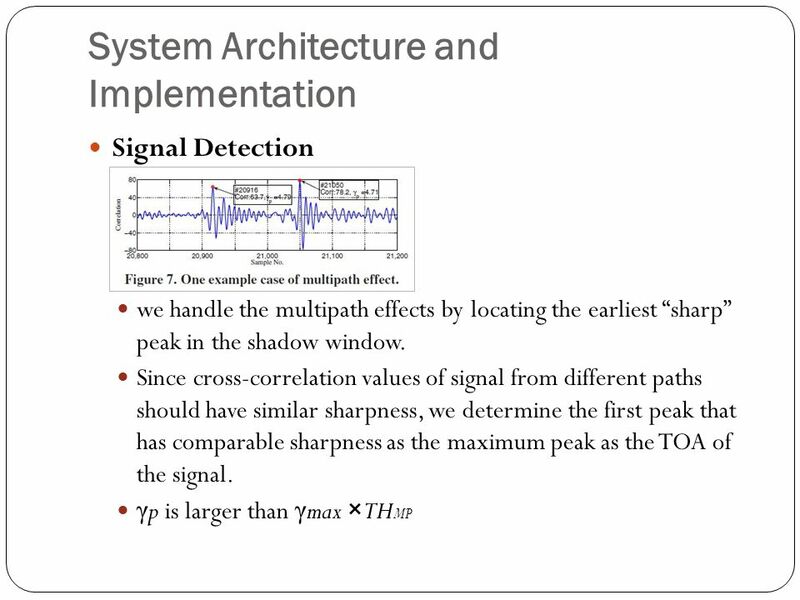 This maximum peak is concluded as the location of a signal if its cross-correlation value is significantly larger than that with background noise. L 2 (S)/L 2 (N) > TH SD. L 2 (S): the L 2 -norm of the cross-correlation values within a small window of w 0 samples around the peak. L 2 (N): L 2 -norm of correlation values in a w 0 window that is at least N samples before the peak. 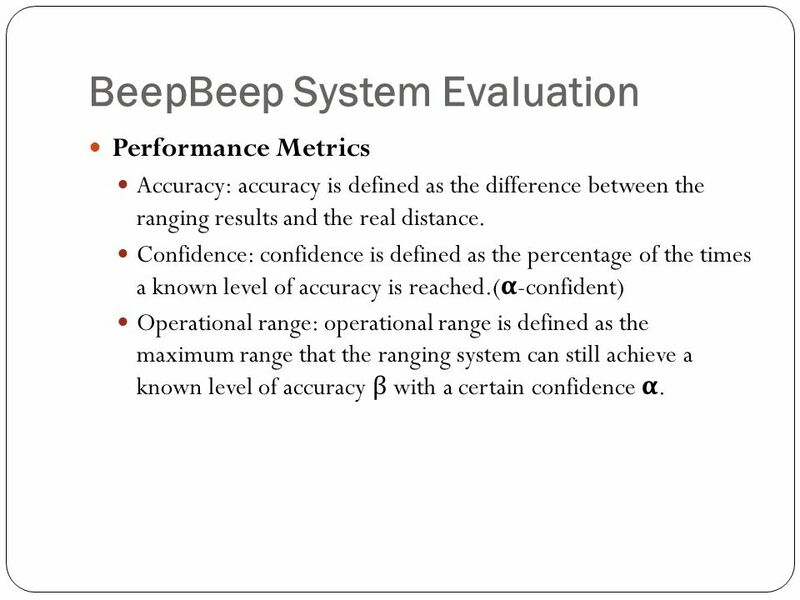 15 BeepBeep System Evaluation Performance Metrics Accuracy: accuracy is defined as the difference between the ranging results and the real distance. Confidence: confidence is defined as the percentage of the times a known level of accuracy is reached. ( α -confident) Operational range: operational range is defined as the maximum range that the ranging system can still achieve a known level of accuracy β with a certain confidence α. 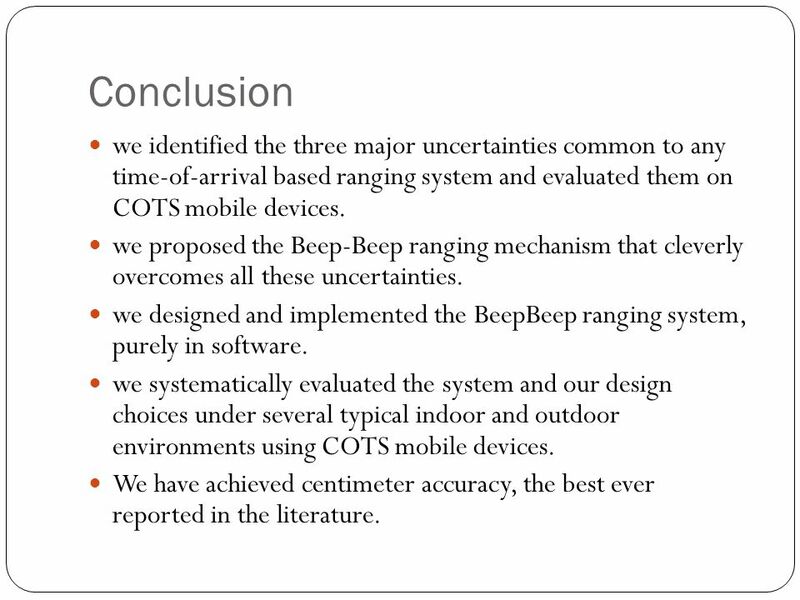 19 Conclusion we identified the three major uncertainties common to any time-of-arrival based ranging system and evaluated them on COTS mobile devices. 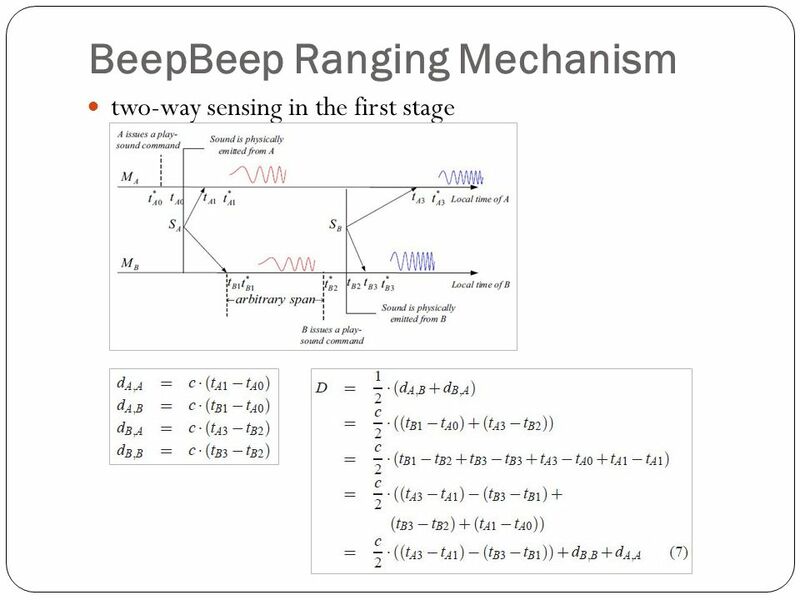 we proposed the Beep-Beep ranging mechanism that cleverly overcomes all these uncertainties. 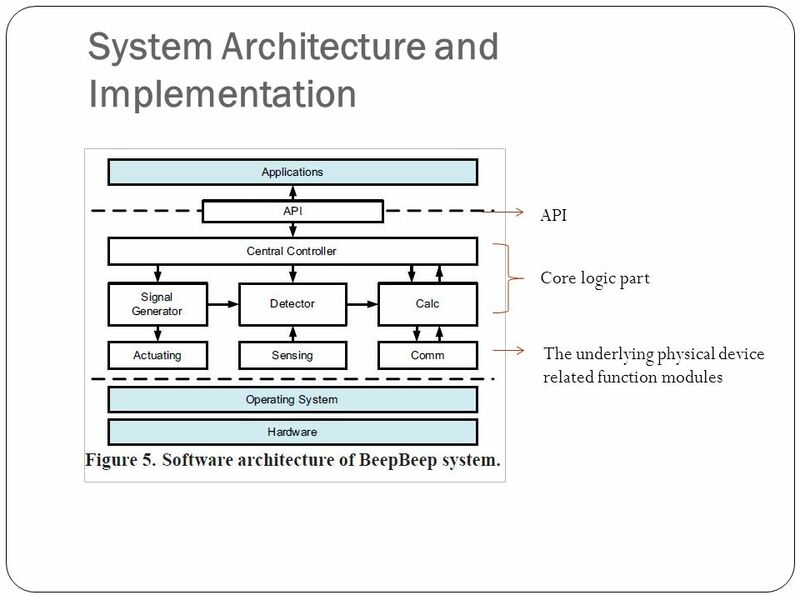 we designed and implemented the BeepBeep ranging system, purely in software. 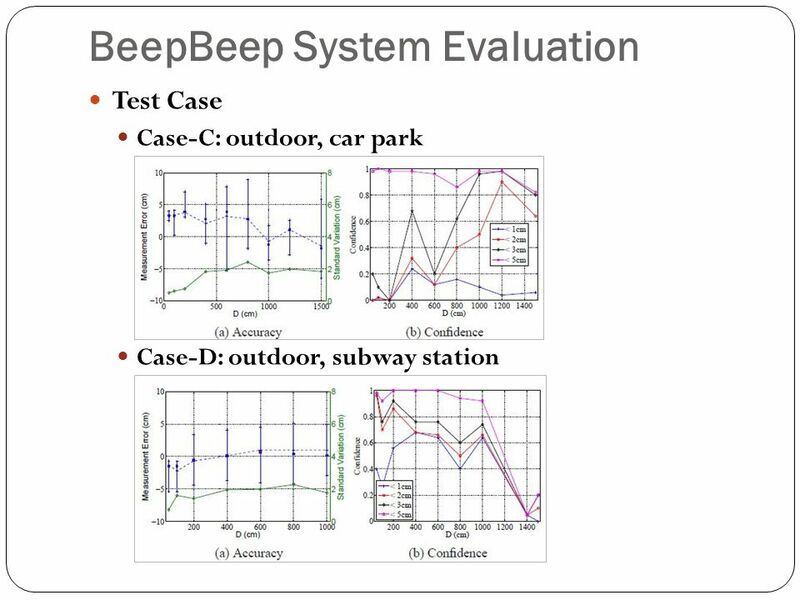 we systematically evaluated the system and our design choices under several typical indoor and outdoor environments using COTS mobile devices. We have achieved centimeter accuracy, the best ever reported in the literature. 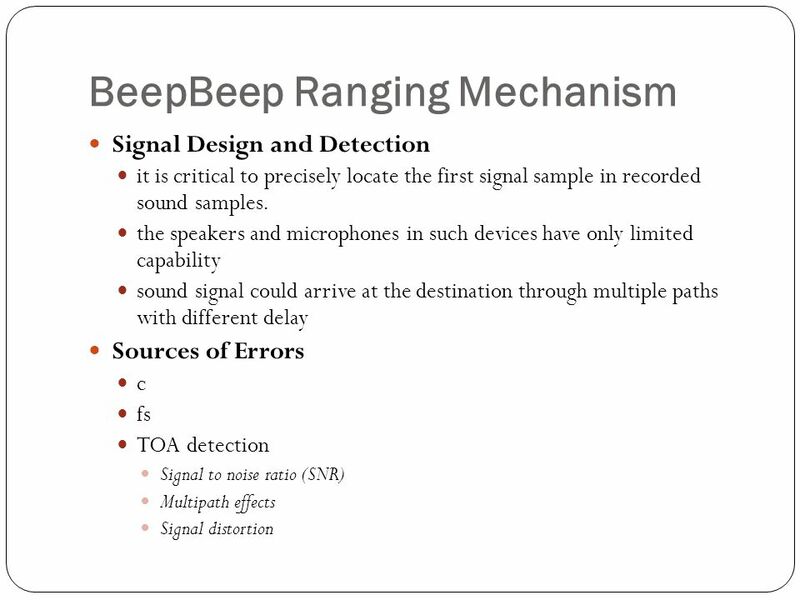 Download ppt "Chunyi Peng, Guobin Shen, Yongguang Zhang, Yanlin Li, Kun Tan BeepBeep: A High Accuracy Acoustic Ranging System using COTS Mobile Devices." © 2005, it - instituto de telecomunicações. Todos os direitos reservados. Pedro Santos Traian Abrudan Ana. FM-BASED INDOOR LOCALIZATION TsungYun 1. Computer Networks Group Universität Paderborn Ad hoc and Sensor Networks Chapter 9: Localization & positioning Holger Karl. 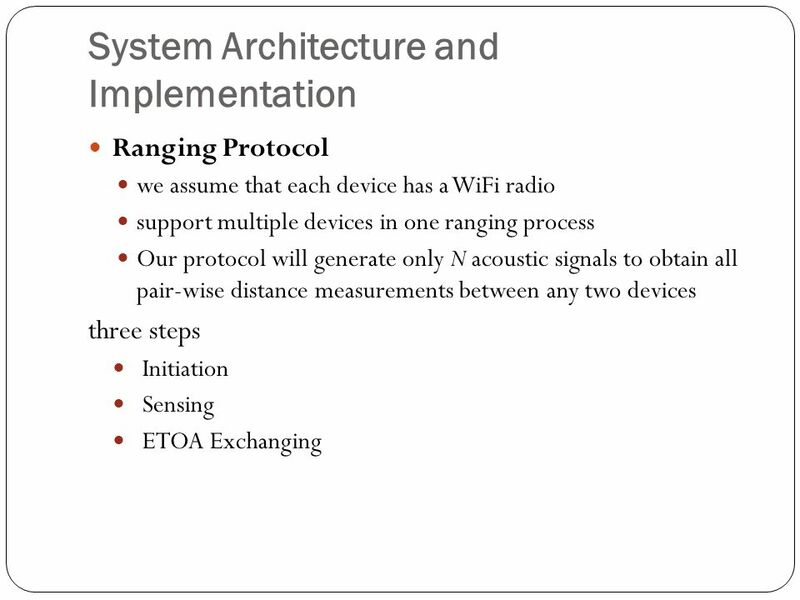 Source-Location Privacy Protection in Wireless Sensor Network Presented by: Yufei Xu Xin Wu Da Teng. 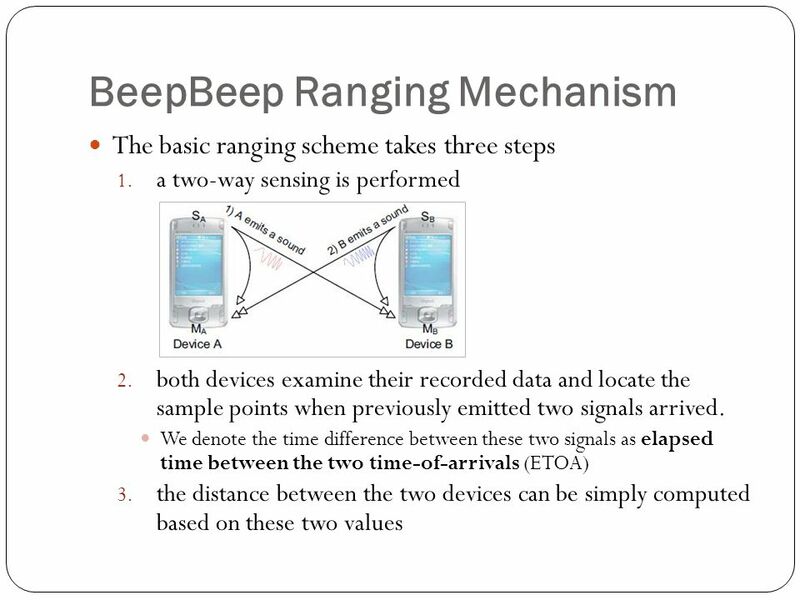 1 PinPoint: An Asynchronous Time Based Location Determination System Moustafa Youssef, Adel Youssef, Chuck Rieger, UdayaShankar, Ashok Agrawala Presented. My first aperosentation 9/6/2008 Marios Karagiannis. Volkan Cevher, Marco F. Duarte, and Richard G. Baraniuk European Signal Processing Conference 2008. Doc. 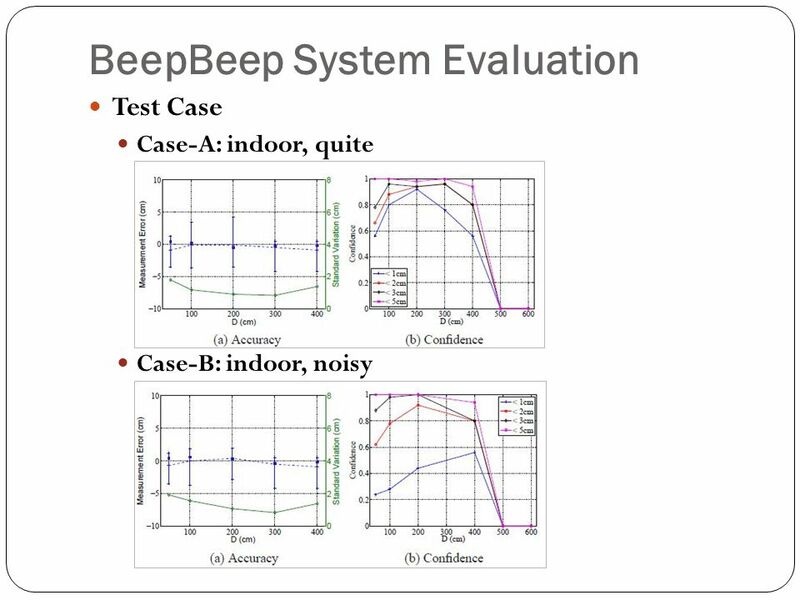 : IEEE /0644r0 Submission May 2015 Ganesh Venkatesan (Intel Corporation)Slide 1 Preliminary Simulation Results on AoA Accuracy in 2.4 GHz. Distributed Systems Fall 2010 Time and synchronization. Communication Systems Simulation - I Harri Saarnisaari Part of Simulations and Tools for Telecommunication Course. TRADING OFF PREDICTION ACCURACY AND POWER CONSUMPTION FOR CONTEXT- AWARE WEARABLE COMPUTING Presented By: Jeff Khoshgozaran. Teaching material based on Distributed Systems: Concepts and Design, Edition 3, Addison-Wesley Copyright © George Coulouris, Jean Dollimore, Tim. Advanced Topics in Next- Generation Wireless Networks Qian Zhang Department of Computer Science HKUST Wireless Radio. Time of arrival(TOA) Prepared By Sushmita Pal Roll No.-13000110009 Dept.-CSE,4 th year.